As you probably already know, Apple today launched the iPhone 6s and iPhone 6s Plus in various countries around the world. As always, fans gathered outside of Apple retail stores in order to be among the first to get their hands on the new iPhones. 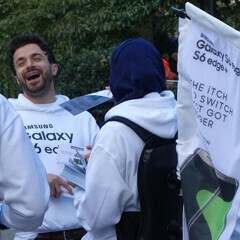 Samsung felt the need to remind Apple users (and smartphone users in general) that there are alternatives out there - thus, it sent out a few employees to try and crash the iPhone 6s launch event at Apple's flagship Regent Street store in London, UK. More exactly, Samsung employees were spotted carrying banners that read: "The iTch To Switch Got Bigger", promoting the Galaxy S6 edge+, a 5.7-inch high-end Android smartphone with a dual-curve display, which was recently released alongside the Galaxy Note5. We've no idea if any of the customers who went to Apple's flagship store in London to buy an iPhone 6s were persuaded by Samsung to make the switch (or at least to ponder it). In any case, it's always fun to see Samsung trying to fight Apple on all fronts, isn't it? not pathetic thats awesome! wish i was there . If you make a great product then it speaks for itself and you don't have to pull these types of moves. It shows a lack of confidence in their product but that's just my opinion. This is coming from a previous owner of an S1,S3, Galaxy Nexus, S6, and currently a Note 5. I doubt Samsung officially endorse this, it's just the staff having some fun. I'm sure that will be the official response at least. If so, the staff will get fired immediately. You can't just do this kind of stuff that makes headlines on your company's behalf, especially when it is in a negative light. Not necessarily. Any publicity is good publicity. "Any publicity is good publicity" Not necessarily. Really? Well Apple tried to bring negative publicity by dragging Samsung to court over the most frivolous and lame bull. It backfired and actually drove even more sells over to Samsung who went from 300M sales to 375M sales in a single year. LOL Notice how idiotic your response is. I did not say Apple has never brought negative publicity. We are talking about what Samsung is doing in THIS situation. Typical fanboy response. Lets ignore what Apple do and concentrate on what Samsung do wrong. As usual. Another stupid response from another biased fanboy. The subject article is about SAMSUNG doing something bad. NOT APPLE. Techie and many others are trying to divert the bad situation from Samsung and put Apple into the mix. However, just because most people on here are saying Samsung is wrong for doing what the did, they are NOT in turn also saying that Apple has never done anything wrong (we all can agree with you there). It's the principle of acknowledging wrongdoing, no matter the Company. So no, it isn't that we are IGNORING Apple. That just simply isn't the subject at hand and is irrelevant. on the contrary, draggin samsung to court was actually good publicity for apple. why do you think did samsung have "copycat" written all over it? it's because apple made a hell of an issue about samsung's supposed copying and got the courts involved. it actually worked to their favor. while some switched to the galaxies, apple's core fans remained intact and sales for the succeeding iphones even rose. Can you prove that the correlation you are stating is linked to the trial? Statistics don't prove anything, they can only give hinds to potential causalities. But it isn't negative. The only people who have a problem with it is Apple ignorant fanboys. What a false statement this is. I'm a huge Samsung and Apple fan. I had a problem when Apple did those stupid commercials making fun of Windows, and I have an issue with Samsung stooping to this level. Is all fun, until someone loses an eye, or someone takes that banner, and wraps the Samsung employee like a burrito. Lol I love rustling jimmies. "Typical iPhone buyer doesn't see past iPhone" And????!!! They found something that works for them. Also, lets not act like the iPhone isn't an excellent product. The only thing funny here is that you don't get Samsung looks silly in this situation. It is absolutely pathetic what they did. "Typical iPhone buyer doesn't see past iPhone" Yes that's true. I can see past any phone, no matter company or brand. I would buy anything that I like, does not matter what brand. I have macbook air(I would have bought xps 13 if it was available lat year), ipad air 2 and note 5. But if you ask iphone user they would buy anything apple makes and never look at second options. I would never buy 6 plus or 6S plus, why they have very screen to body ratio, iphone 7S, I might if it will have better screen to body ratio, I will surely miss stylus though. I don't care about thickness of product, all 3 dimensions matters. iphone works, yes, and moto g for $220 works as well, if you are paying top price, you should get best product, right? No one here said the iPhone wasn't a great product...DID THEY? But the S6 is a greater product as many sites have already stated. The S6 is a greater product than the iPhone 6s? Many sites say this? Techie, you are incredibly misinformed. Also, the two phones serve different purposes. Can we just agree they are both solid products? Whether the S6 is a better product is a personal opinion, not something a website can tell you. Its okay to have enuf. Its better to have more and be impressed. IF for you having just enuf is fine then go for it. an iphone is limited in so many way its crazy. Its like having a car with a 1000 hp engine but just a 20 L gaz tank. Sure its okay to go to work and come back but is it logical? Is it logical when you pay more than almost any other car to have lower gaz capacity? This is just an example. for the price they sell them and the profit they make on them here what should be included in the 6S 32/64 onboard memory. 3 gb ram. 3000 mah battery. quad core cyclone based SOC 1080p 4.7 inch screen 2k 5.5 inch. All with IOS on top. Thats what its should be and thats a minimum! Make the phone a bit thicker if you need to. and dont tell me you would not be happy with such spec. Would still not be top notch but much more logical for the price you pay. Truth be told. This behavior is very disrespectful, even from a business empire like Samsung. Yes, they're an empire and have lots of businesses like Home Electronics, military tech, and insurance. I don't see the disrespect. Everybody looked cool with it, more like a friendly reminder.